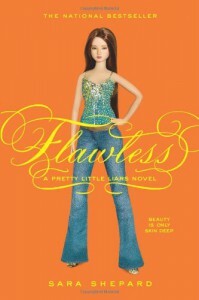 This was actually a reread for me, I read about three chapters then recalled that I already read Flawless in eighth grade. And I can honestly say that I enjoyed it much more now, when I first read this novel it scared me so much that I actually had nightmare (I read the first two books back to back) I felt that I did need to read this book the second time because I had missed small details the first time that I may need to continue this series. Overall, I really do enjoy this novel, the series and also the television series. I would recommend this to anyone who is looking for a quick but intense read, I couldn't put it down because I needed to know what happened next. Also, throughout the entire novel I was trying to guess about who "A" was and I was trying to solve the mysteries.